Our entry way has improved significantly over the years, but it is still pretty boring. Before he passed away, my dad graciously helped us build this built in coat rack into the wall behind the door. It added a space for us to hang our coats and bookbags, and we have used it so much. I subscribe to the belief that organization should be both functional and attractive. While our entry way is now functional for our family, it certainly isn’t pretty. I’d like to change the following things about our entry. I’d like to paint the back of the door black to give it some personality. I love how the black door makes the room look different. It’s amazing what you can do with just a can of paint. Another thing I’d like to do is change out the builder grade light fixture for a schoolhouse light fixture. I’d also like to add some sort of striped rug. I love this Dash and Albert rug, but I’d like to have it in black and white. And lastly, I’d like to add some sort of boot tray to contain muddy shoes. As with everything, our entry way is a process. We are working to make it look nicer and neater all the time. I can’t wait to show you the progress as we finish it. Have a wonderful week. We will return on Thursday to talk about command centers. I don’t know about you, but cleaning is a struggle at my house. My house isn’t all that big but it is time consuming to give it the attention it needs. With two children and a full time job, it is even more difficult sometimes to get the house clean. Before I share the things I have learned, I want to make it clear that I have not completely figured it out yet. These are just a few tips that are helping me work toward finding a balance, even though I have far from found that balance. You will notice that starting the washing machine each morning is on the list. We have a washer with a delayed start and I use it daily. I throw laundry in the washer before going to bed and set it to finish as I’m getting up. This way, I wash and dry a load of laundry before leaving the house, and have one more load to complete when I get home. I still have to fold them and put them away, but the waiting game is over. You don’t have to do everything, and you can’t. Assign chores to the other members of your household. My oldest daughter is eager to earn a small allowance for her own money, and she doesn’t mind helping me around the house. Pay your children to help you, convince your significant other to help you, but stop trying to be solely responsible for all the cleaning. I try to have a deep cleaning day one Saturday a month where I tackle cleaning tasks that don’t necessarily need to be done weekly, but still need a little extra love. These are areas like baseboards or dusting the door and window moldings. You could even break these deep cleaning tasks up and do one each Saturday. It’s all about your schedule and making things work for you. Sometimes, you won’t have time to clean because you’ve had a busy day. Or maybe you did clean, but something happened and your room is no longer clean. These are the moments when you must have grace with yourself. Your house can’t be perfectly clean all the time but neither can anyone else’s house. I hope you have enjoyed these tips for simplifying cleaning. As I said before, I am still working to simplify cleaning at my own home, so if you have any tips for me, I’d welcome them 🙂 Have a wonderful day! We’ve been blogging here for a good five years now, and in that time, we’ve had a lot of questions from readers. One question we’re often asked is this: “You all seem to always be doing something to your house. How do you do so much?” Today I’d like to share how we prioritize our projects. We just did a small remodel of our master bathroom. We replaced mirrors, hardware and light fixtures. We eventually plan to replace the bathtub and surround and flooring as well, but it simply isn’t in the budget right now. So we started with the cheapest, easiest items on our “master bath to-do list” and we completed those. We love carriage house garage doors, but we neither need nor want to buy a $2,000 garage door at the moment… so we took to Amazon and ordered faux Coach house door hardware and a faux window kit for $50. We spent far less money something that looks like the real deal. 3. If you can DIY it, do it. Custom closets are expensive, but my dad and I built this closet organizer ourselves for $100. It only took one day and it was a fairly simple project. We saved a lot of money by doing it ourselves AND it was a lot of fun. 1. Who will it benefit? If it’s something that will benefit everyone in the home, bump the project up higher on your to do list. 2. Can I do the project in phases, or must I do it all at once? If a project must be done all at once, but it’s small, it’s probably OK to raise it on your list. If it’s a big project and you can’t do it in phases, it’s probably expensive and should be lower on your priority list. 3. Do I need to do it, or just want to? Projects that you want to do, no matter how much you want to do them, are never as important as the projects you need to do. Even if you can’t afford the things you want at the moment, save money until you have what you need. How do you all prioritize projects? I blinked in June and suddenly, it was August. I’m not sure where summer went, but wherever it went, it left quickly. My oldest daughter starts school next week. The school supplies have been purchased and the school clothes have already been washed and put away. But what else can we busy Mamas do to ensure we are all better organized for the coming school year? Plan out outfits, meals, and even lunches. Prepare ahead of time as much as possible. Make lists of everything you need to do and buy in the coming week and review it often. The better prepared you are, the better you will handle those unforeseen circumstances that pop up and stress us out. You can’t remember everything and you don’t have to try. The minute you hear about a meeting or event, write it down. Don’t give yourself the opportunity to forget it. The other step is to refer back to your calendar at least weekly to see what’s coming up. Wake up early one morning before school starts and drive to the school at regular time. This will help you become familiar with the traffic patterns, the route, and will help you anticipate any hazards or obstacles that may make you late. Of course, there will still be unforeseen things from time to time, but having driven the route once before helps put your mind at ease. Does homework come with tears and tantrums in your house? Having a set “after school routine” can take some of the fuss away. Set the expectation early in the school year that homework is done as soon as you walk in the door and stick to it. I always tell my daughter that it I better to get homework out of the way first thing and then you no longer have to worry about it. Having set morning routines can also eliminate some of the morning rush as well. Who likes being in a hurry? Not I. When I’m hurried, I get stressed and I end up forgetting things. Which stresses me out even more. Waking up earlier allows you more time but also allows you time to eat breakfast. Studies have shown eating breakfast improves brain function and helps sharpen your focus. It’s hard to concentrate on anything when your stomach is growling!! I hope you all have a wonderful weekend and a fabulous first day of school. Most of us are guilty of working too much, and sacrificing all of our time for everyone else. There is nothing wrong with working hard or giving time to others; in fact, those things are great. But sometimes you do need to take a little time for yourself. Waking up about 15 or 20 minutes earlier can allow you a little time for yourself. Read a book, go for a walk, or enjoy a cup of coffee on your porch. Is there anything you do each day that wastes your time? I waste a lot of time on my Smartphone each day. By eliminating some of that, I have been able to spend more time on things that make me happy. You can’t do everything. I’m the worst for trying to do it all. Delegate some of those chores to your kids. Kids can help with laundry or loading the dishes. Kids can help pick up toys and straighten up the house. Trying to do everything will only stress you out and steal all your time. Overextending yourself by taking on too much results in stress and no free time. Free up some time by saying no. When you carve out a bit of time for yourself, think about the things that bring you joy. Whatever makes you feel renewed and happy, do it. Don’t feel guilty about taking time for you. Take time for yourself and be more relaxed. As a busy mother of two with a full time job and a part-time business on the side, I know a thing or two about how difficult it is to cook. I also know that when you’re not prepared, it’s a lot easier to justify running to the drive through, where you end up spending money and making choices that aren’t the healthiest. Once during the school year, we went over our monthly bank statement to discover we’d spent $400 that month on eating out. We were shocked…and vowed to do better. We are now doing an experiment in our house- we write on the calendar each time we eat out, and write down each time we cook at home. This is helping us keep track of how much we are spending, but also on how often we are eating at home. I’d also like to share some other things you can do to ensure that meal times run more smoothly in your home. 1. Keep staple ingredients in your pantry at all times. Who else here has started following a recipe, only to find that you were missing one or two ingredients you needed? Isn’t it frustrating? Think about your family’s favorite things to eat at home, and isolate the ingredients that are common in those recipes. Then, make sure you keep a stockpile of those ingredients in your pantry and fridge. Planning ahead means that you already have a good idea of what you are going to cook for that week. I have tried to plan two weeks of meals at a time, but sometimes life happens and we don’t stick to it entirely. I’ve now started planning for one week at a time, and planning based on what I have in the pantry, fridge and freezer that week. This way, I am taking our weekly activities into account as well. Gymnastics on Tuesdays? Use the crock pot so it isn’t as time consuming and there is little clean up. Church on Wednesday night?How about salads for dinner? You get the idea. Do you ever find that there is a giant mess in your kitchen after you cook, and you often do not get to it until hours later? I have had to wake up early before to clean the kitchen from the night before. One way that I handle this are to fill the sink with soapy water and wash/rinse utensils as I’m cooking. I can also soak bowls and pans before popping them into the dishwasher. The second thing I do is to reuse a bowl from meal prepping to put food scraps or trash in. Having a trash bowl saves me trips to the compost bin or trash can. I use a dish that I’ve already used so I’m cutting down on dirty dishes. It doesn’t sound like a huge deal, but it really helps. I’ve reached a point in my life where I’ve realized I need to spend a little more money at the grocery store to get pre-chopped vegetables once in awhile. I initially felt silly about this, but then I realized it truly does save me a lot of time and prep work in the kitchen. The Benefits of Living with Less…and why you should purge your house right now! June 27, 2018 by organizednsimplifiedLeave a Comment on The Benefits of Living with Less…and why you should purge your house right now! RIGHT Now. Drop everything and PURGE YOUR HOME NOW! No, I’m kidding. Sort of. I am currently in the midst of a whole house purge, but we will talk more about that later. The truth is, living with less has a lot of benefits. Some are health benefits, some are financial benefits, and some are so good they don’t fit into any category. I’d like to share a few of those with you today, as well as some great advice for purging your home that I’ve collected over the years. Living with too much causes your house to feel cluttered. A cluttered house feels chaotic, and makes it hard for you to relax and destress. Continued stress affects your mental state, as well as your physical health. An organized and clean home evokes a peaceful feeling, and who doesn’t want to feel at peace in their own home? Living with too much makes it harder to find places to put things away. Having nowhere to put things causes your home to look and feel cluttered (see above). A cluttered house also seems dirty even if it really isn’t. Having less stuff and less clutter makes your house look and feel cleaner. How does living with less save time? It means that you spend less time looking for things. It’s been said that the average person spends four years of their life looking for things that they are missing. Not being able to find your missing items makes you stressed. Having less stuff means that you don’t have to sort through so much when you need something. How is this? Well, when you make a conscious effort to live with less, you are much more intentional with your spending. Additionally, who here has ever bought something, only to realize you already had that same item at home? Living with less makes it easier to distinguish what you need- therefore keeping you from spending money on something you already have. 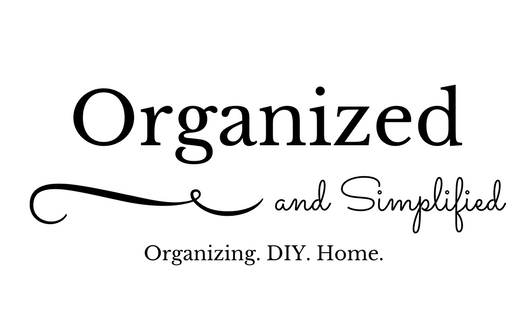 There are many benefits to having an organized and simplified home, with less stuff. Start with one room at a time and keep only what you need- donate, recycle or throw away the rest. I know many people who wish their home was less cluttered, but I don’t know anyone who wishes their home was MORE cluttered. Start today and you’ll soon see the benefits.